Enoch Pratt House. Photo courtesy Brian Miller. By the mid-19th century, Mt. Vernon had become the most fashionable neighborhood in Baltimore as Baltimore’s barons of finance and industry built grand homes on the squares around the Washington Monument in Mount Vernon Place. Take a look inside some of Baltimore’s most beautiful and grand buildings. Start / end your tour at the Mt. Vernon Marketplace (520 Park Avenue) offering discounts at select vendors throughout the marketplace! 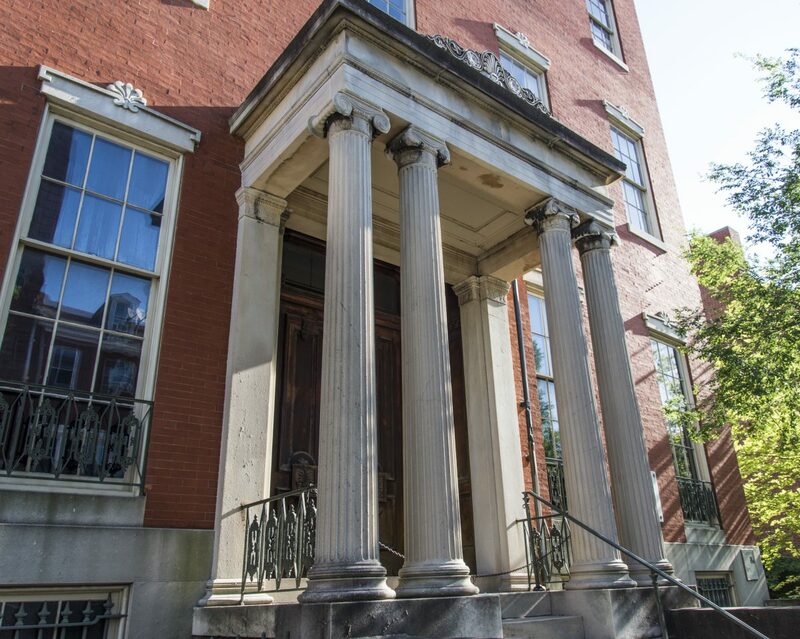 Enoch Pratt, a wealthy hardware merchant and benefactor of the Enoch Pratt Free Library, commissioned this Greek Revival style mansion in 1841. He later hired Edmund G. Lind, a prominent Baltimore architect, to add a fourth floor and marble portico. Pratt spared no expense on the interior which includes a double parlor with soaring windows opening onto cast-iron balconies, marble fireplaces and elaborate plaster ceilings. Enoch Pratt House is currently owned by the adjacent Maryland Historical Society. Built in 1818 by Maximilian Godefroy, the First Unitarian Church of Baltimore is a fine example of Romantic Classicism. In 1819, Rev. Dr. William Ellery Channing delivered the landmark Baltimore Sermon at the First Unitarian Church, which led to the formation of the Unitarian denomination. In the late 19th century, the interior underwent a major reconstruction during which Tiffany windows, a Tiffany mosaic, barrel vault and a Niemann organ were added. Throughout its history the congregation has boasted prominent Baltimore citizens including George Peabody and Enoch Pratt. Continuously operating as a Unitarian Church since 1817, First Unitarian is celebrating the bicentennial of the dedication of the church building. Come join the celebration and hear the Niemann organ be played! In the 1870’s, William Walters, a prominent liquor wholesaler and avid art collector, would open his art collections to the public on Wednesdays in April and May. When William died in 1894, he passed his art collection to his son Henry who acquired more art works and commissioned construction of the original Walters Art Museum building in 1905. This building was modeled after the 17th century Collegio dei Gesuiti in Genoa. A brutalist-style addition was constructed in 1974, and renovated from 1998 to 2001 to feature a glass facade. The Walters collection features 32,000 objects from across the globe representing 55 centuries of history. Come see the works of art in the newly revitalized One West Mount Vernon Place, a spectacular 19th century mansion! This impressive home was built for George Small, a wealthy merchant. In 1890, Theodore Marburg, ambassador to Belgium, bought the resident and began a six year renovation to include the addition of a grand staircase, an addition one and a half floors, and a new facade. Marburg, a collector of ornate furniture and art, elaborately decorated the interior. It is now offices for Agora Publishing. Emmanuel Church, a daughter parish of Christ Church, Baltimore was founded in 1854. Designed by Niernsee & Nielson, the original building was in the fashionable Italianate style with a Tuscan bell tower and rubble masonry. Today, only the exterior walls and lancet windows are left of the original design as the church was extensively renovated in the 1910s and 1920s by Rev. Dr. Hugh Birkhead. Architects Goodhue, Cram and Ferguson transformed the church by and raising the roof and floor to create room for a chapel on the lower level and adding a Gothic tower. This larger, Gothic inspired building is what you see today. Come visit and be sure to see Tiffany windows and a magnificent John LaFarge window in the nave and Daniel Chester French sculpture in Baptistry. All areas, including Eccleston Chapel, can be reached through main entrance on Cathedral.